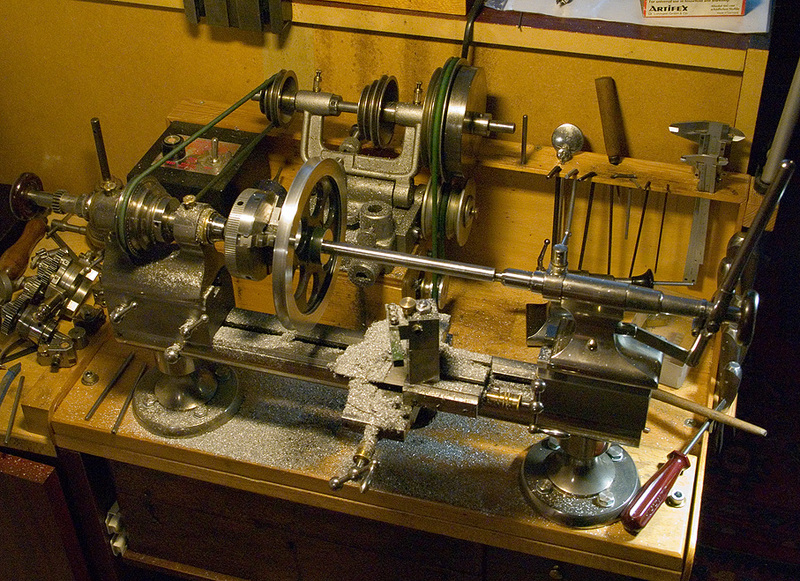 This gadget is shown in the 1912 Wolf, Jahn & Co. catalogue and advertised for the larger larger lathes to go into the three-jaw chuck and hold 8 mm collets for small work. According to Dingler's Polytechnische Journal (1896, Vol. 300, p. 180, http://dingler.culture.hu-berlin.de/article/pj300/ar300043) this gadget was developed by a mechanic Richard Nerrlich in Berlin the tool company Grundmann & Kuhn in Berlin obtained a trade-mark for it. It is equally useful as a hand-held collet holder. I got it with a box of other pieces for WW-lathes. The tightening nut was missing and I have made a new one. Quick-change tool-posts tend to be expensive, but useful items. The main body of the Leinen-made one costed EUR 90 net equivalent according to a 1996 catalogue I have. The inserts would have set you back another EUR 60 each. So I decided to make my own; inspired by the Leinen design. I actually gave it two dove-tailed slots, but this is really unnecessary, as I found that I am turning it anyway to provide clearance etc. 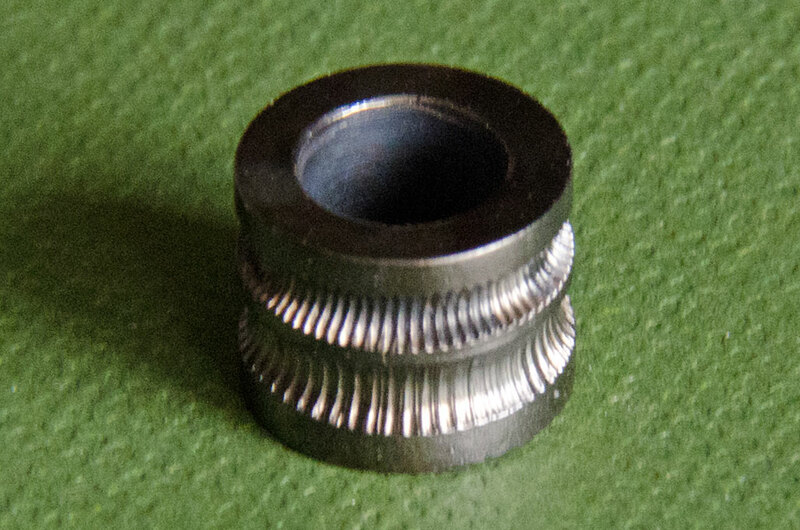 Originally, the height-setting knurled nut was locked with a stop-nut, but I found this design somewhat cumbersum to handle. After a few years I replaced the threaded stud with a thumb-screw and lock the setting with a worm-screw from underneath. 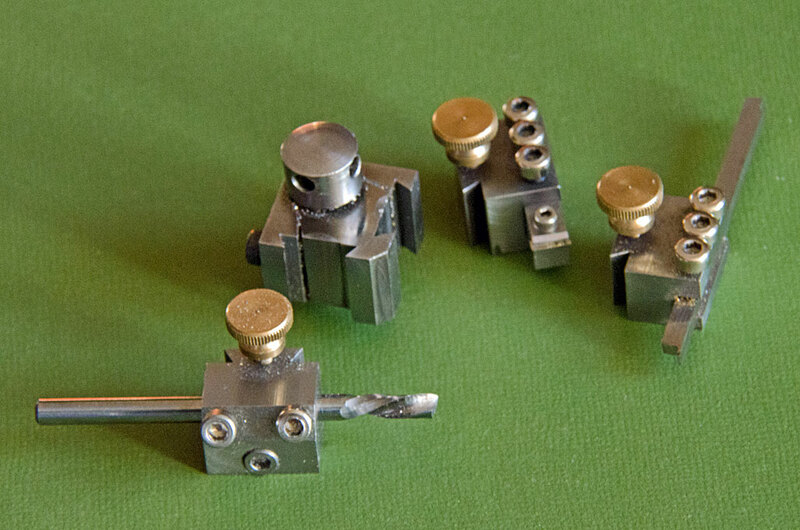 A range of inserts were made for 6/5 mm tool-bits, for 3 mm tool-bits, and for 4 mm round tool-bits or boring bars. 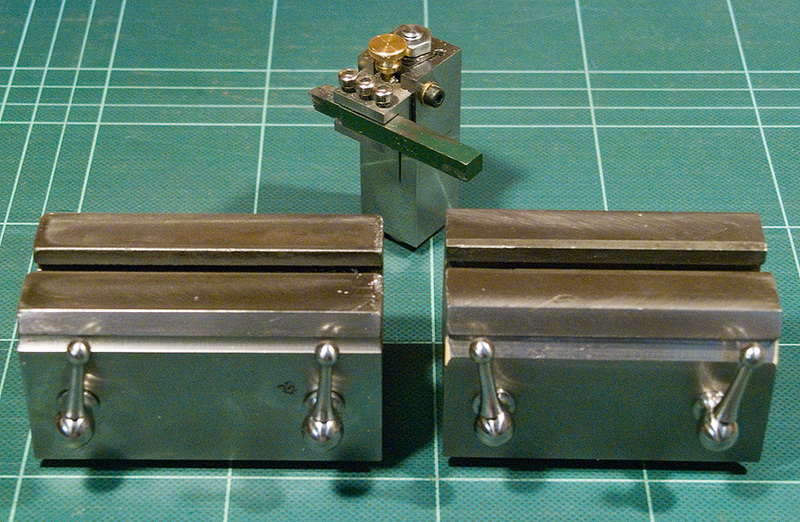 Sleeves for the latter allow to use smaller diameter tool-bits or boring bars. If the repeatability of height-setting is all what you need, then there are simpler designs; for instance a round stud clamped into the T-slot and simple slotted holders sliding on it and being tightened down with a compression screw. Good boring heads tend to be equally expensive. Also, I wanted one that is not too heavy for use on the small mills and that has not too much off-centre mass when extended. 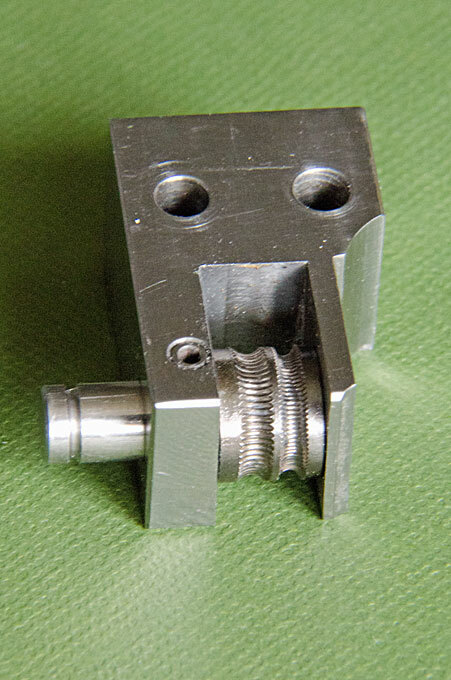 It is made of aluminium and fits onto an 8 mm arbor with a M8 thread. It is bored for 8 mm shank boring bars etc. 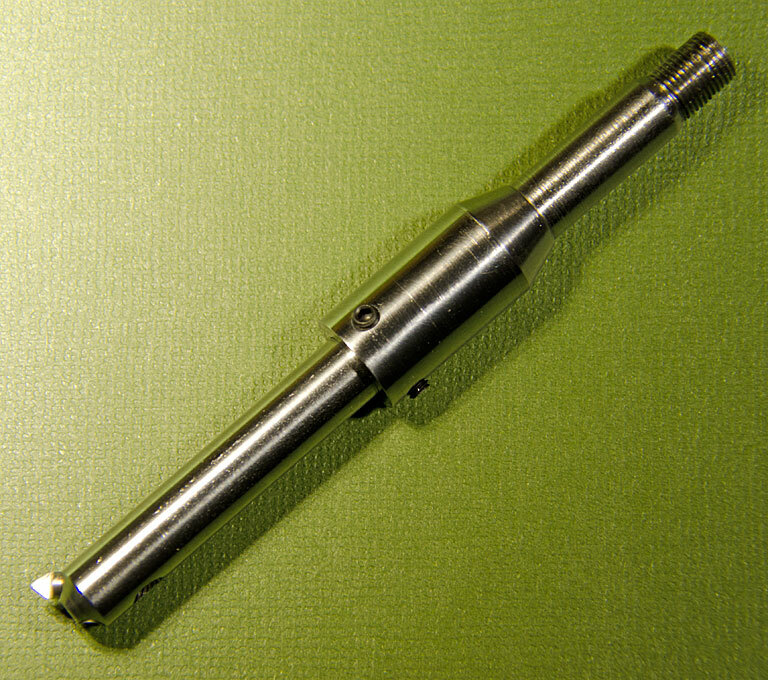 A simple micro-adjustable boring bar was fashioned from a piece of 8 mm rod. One end was chamfered 3 mm wide at 45°. Through this chamfer a 2.5 mm through hole was drilled at the same angle. The hole was tapped M3 for about a third of the length from above. 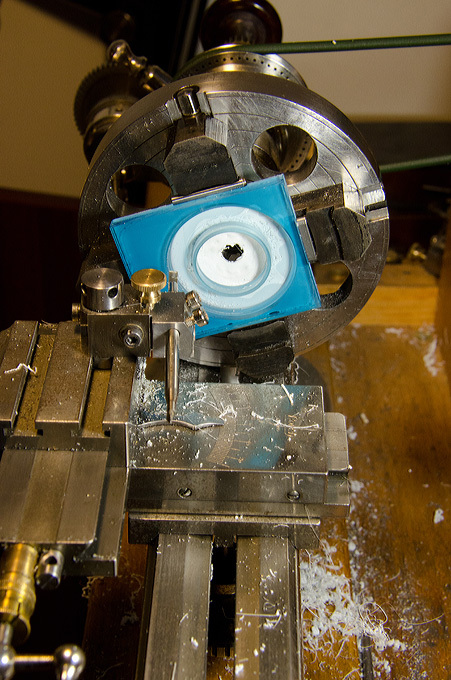 The other side of the hole then was enlarged to 3 mm for the cutting tool ground from a short length of HSS tool-bit. The tool-bit can be pushed out with a set-screw to increase the cutting diameter in a controlled fashion. 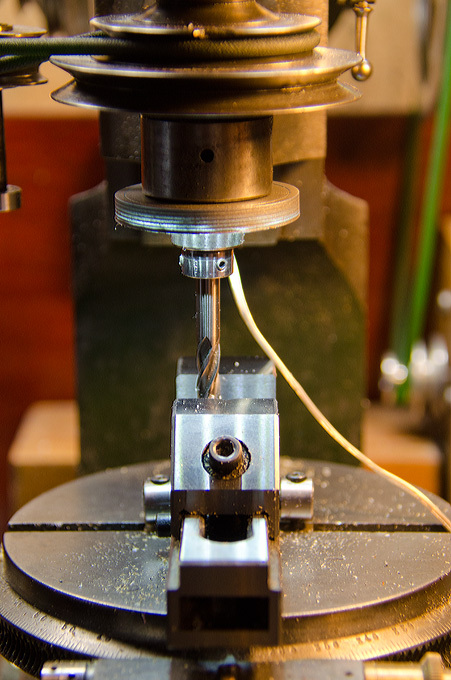 The boring bar is drilled and tapped from the opposite site of the first hole to take a set-screw for locking the tool-bit. 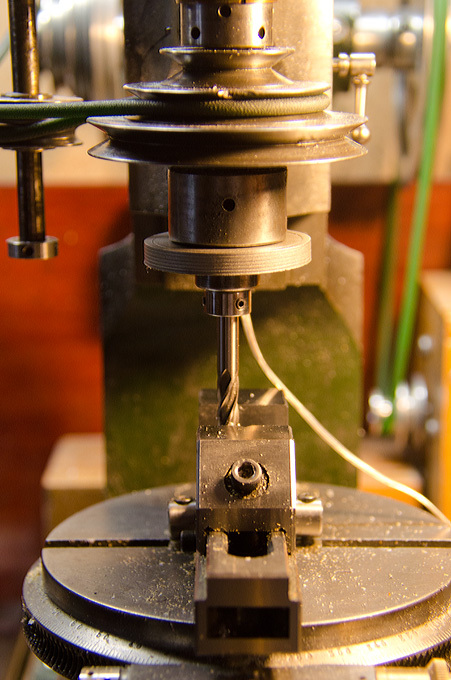 The Wolf,Jahn & Co. Model A milling machine has an integrated rotary table for indexing and it is convenient to hold workpieces upright in a collet or even a chuck. 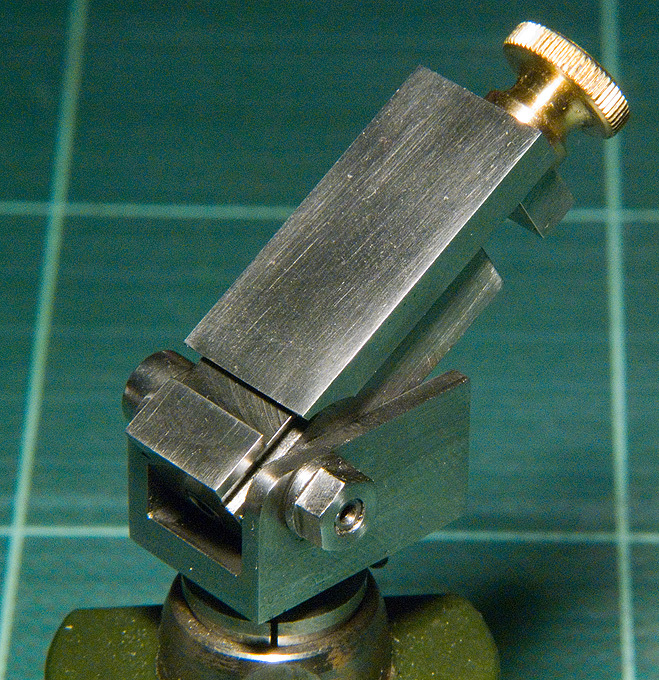 for this pruposes I made a non-indexing collet-holder that can be mounted in the centre of the rotary table. It can take ordinary split collets, wheel chucks, ring-chucks, or even the three-jaw scroll-chuck. 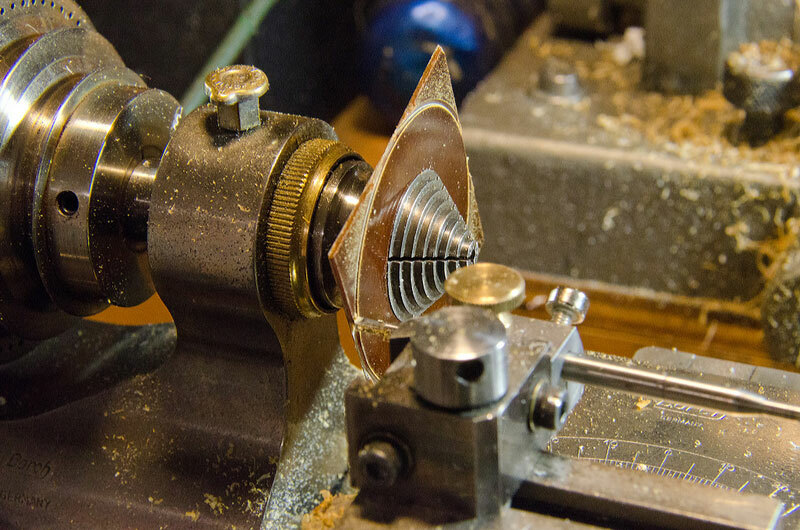 The cone on top mimics the spindlenose on the lathe for this purpose. The collets are drawn in by a nut, which can be tightened by a bar. Using various types of collets. Also shown is the tightening bar. The finished collet holder mounted on the Wolf, Jahn & Co. miller. Right a six-jaw chuck is held in it. Unortunately, sinus vices are rather expensive and also not available in very small sizes, suitable for the Wolf, Jahn & Co. or Dixi milling machine. 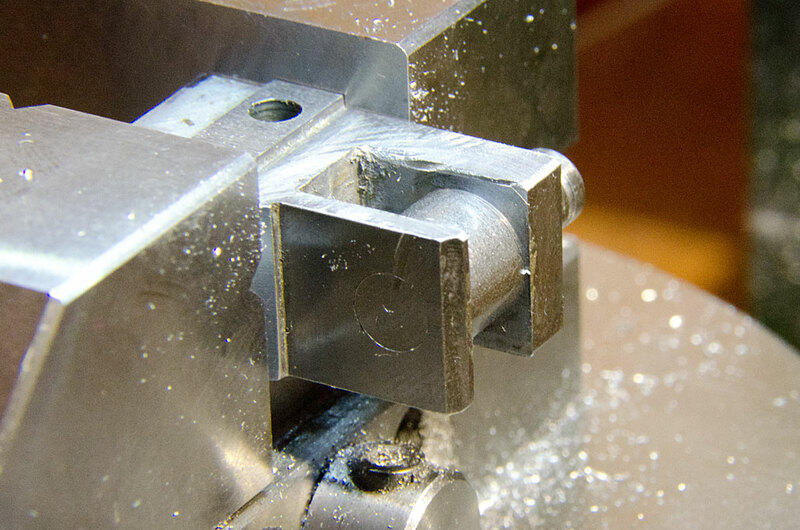 On the other hand, sometimes angles need to be milled at workpieces. 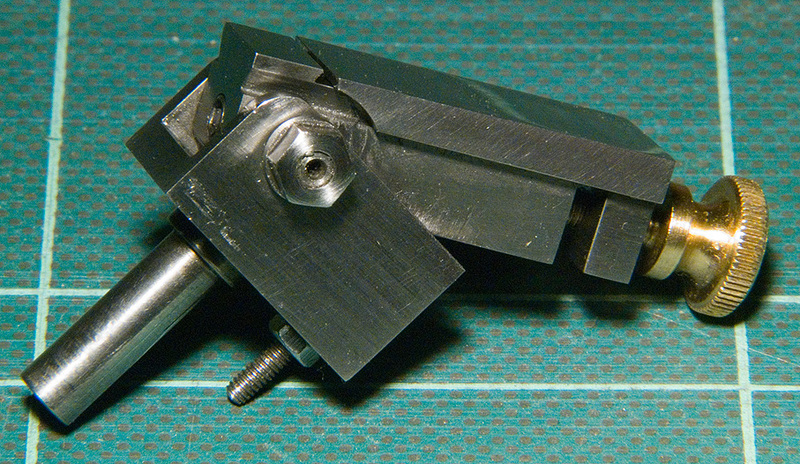 In order to enhance the respective milling capabilities, a tilting holder for a 25 mm jaw-width toolmakers (or EDM) vice was designed. It was fabricated from a single piece of 25 mm square aluminium bar. All milling operations were performed on the WJ&Co. machine. The slot for the vice in particular was milled in situ, in order to ensure that it is perpendicular to the spindle axis of the mill. 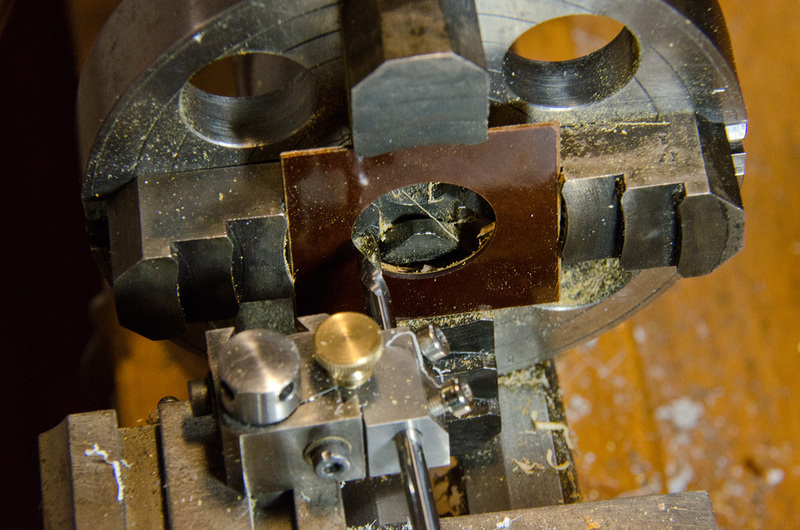 The holes for the tightening screws that hold the vice were drilled on the Dixi mill, which in turn ensures that they are horizontal. 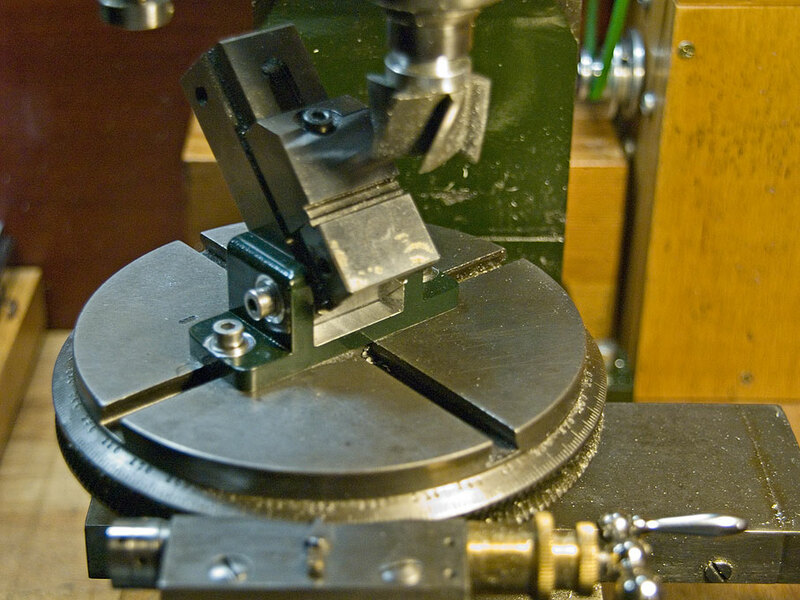 The tilting device allows to move the vice from a horizontal through to a vertical position. The angles will be set with angle templates against the spindle nose. The ordinary fixed steady is just too clumsy and does not close well enough for miniature work. 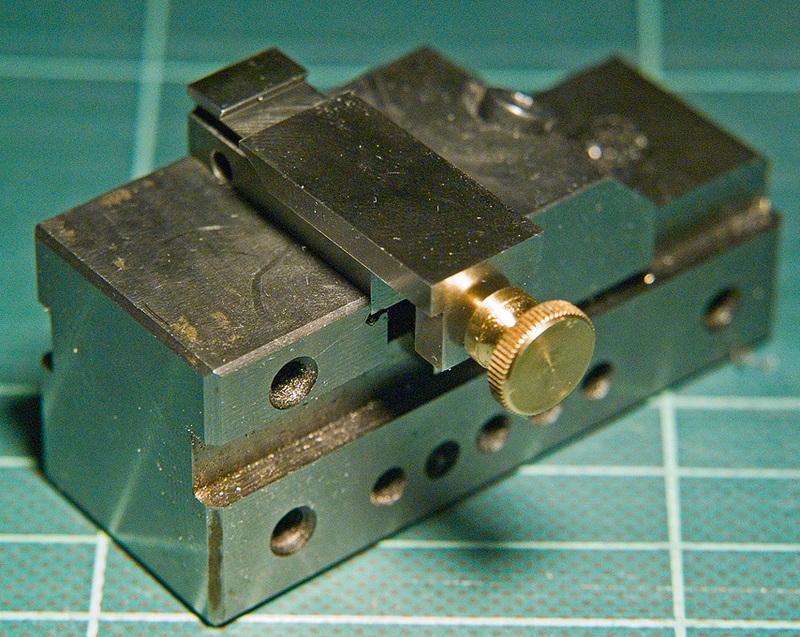 To overcome this I designed a miniature steady that can be finely adusted in height and horizontal centre. In principle it can accomodate work down to zero diametre. It uses the base from the steady for the dividing apparatus on the mill. 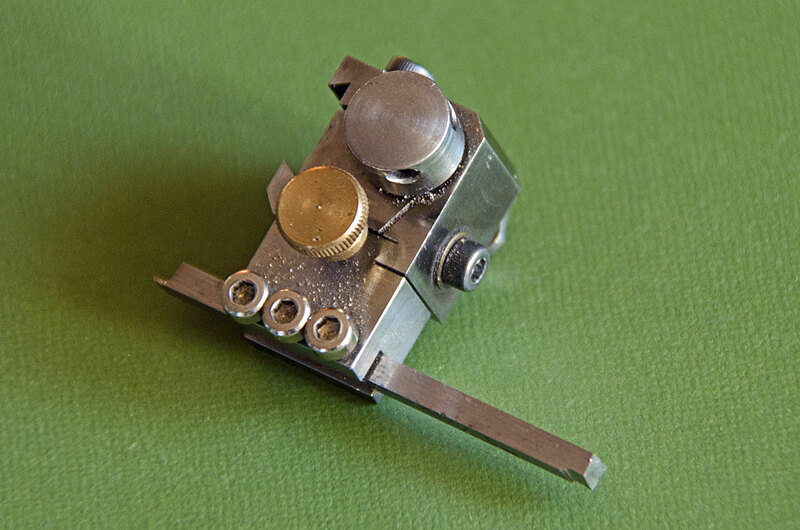 For some work even the miniature fixed steady gets into the way of the slide-rest. To overcome this situation a micro fixed steady was constructed that is based on the tailstock runner for pivot drilling attachment of the lathe. Instead of the centering disc, a stub with a little brass arm was made. The brass arm has a 90° V-notch and can be adjusted to the diameter of the work. 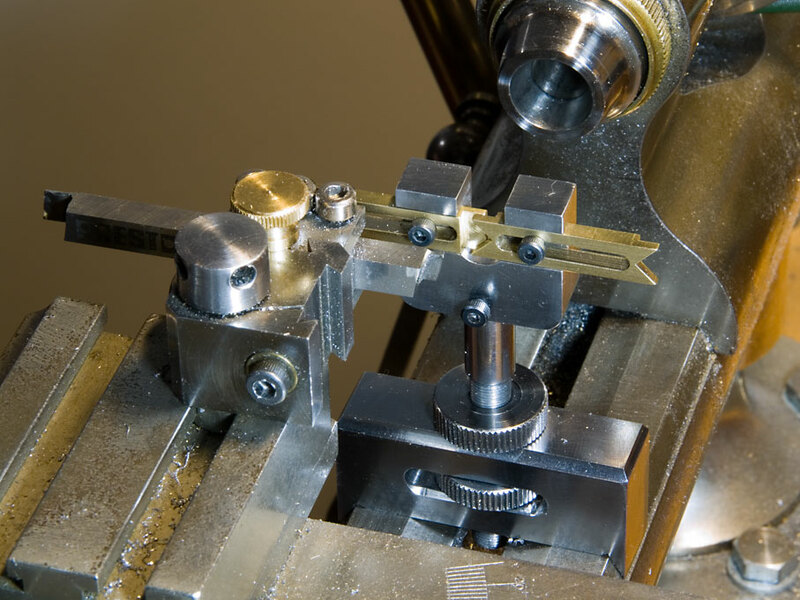 The tailstock runner can be turned by 360° without loosing the center, so that the arm can be positioned conveniently to counteract the pressure from a slide-rest tool, which tends to deflect the work op and away, or for filing, which tends to deflect the work down and away. For some work the 50 mm centre-height of the WW-lathe is not enough, but in this kind of lathe is can be heightened using raising blocks. However, such raising blocks are extremely difficult to find. After years of search, I was lucky to find one that seems to have come from a Pultra lathe, together with another one that seems to have been shop-made. Though they came together, they didn't actually align properly and a considerable amount of milling, scraping and trying went into them, before a satifactory alignment was achieved. For aesthetic reasons the outsides were also milled down to make them look more or less equal. The excentric hold-downs that came with the blocks were in a bad shape and were all four replaced with shop-made ones that also ballhandles to match the style of the Lorch, Schmidt & Co. lathe. 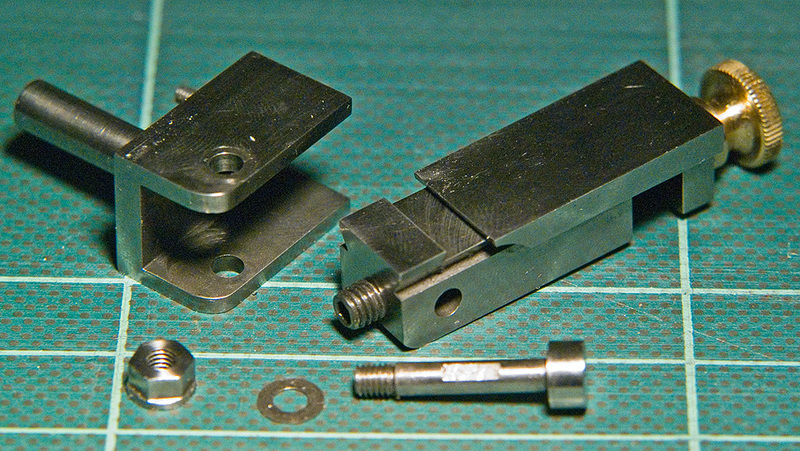 As there was no raising block for the cross-slide, a raised tool post was fabricated from a square piece of steel to take the holders from the the quick-change tool post. The first job tackled with the increased centre-height was to turn the proper 60° groove for round belts onto the large pulley of the reduction pulley set for the vertical mill. 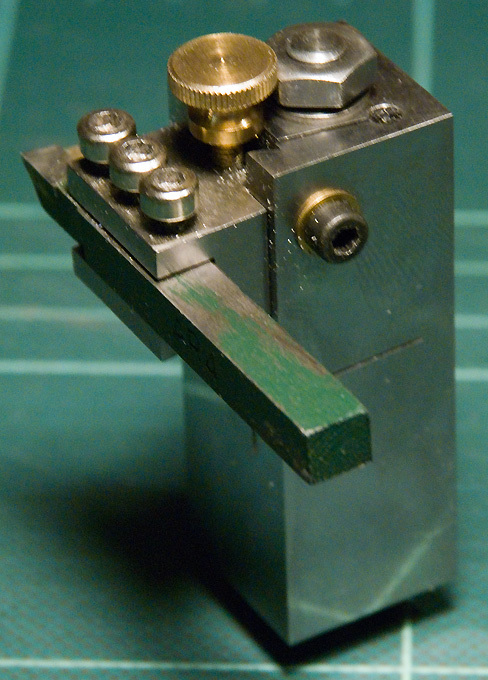 Most commercially available vices are too big for holding small and in particularly flat parts for machining. 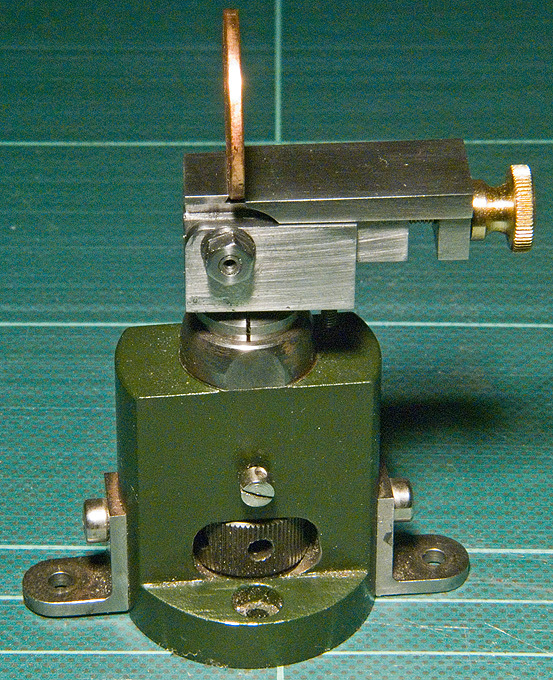 To overcome this limitation I constructed a small tilting and swivelling vice. 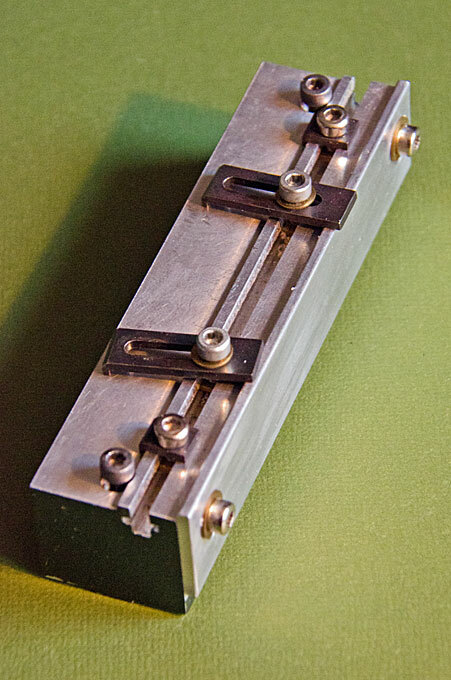 It is designed to hold parts with a footprint of up 10 mm x 10 mm. 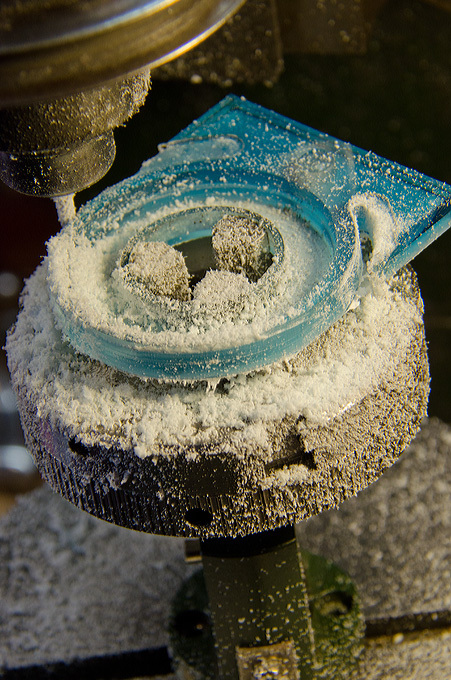 The jaws are also only 1 mm high, allowing surface milling of parts down to just above 1 mm thickness. Thinner parts are held down by the inclined jaws, but then not the full surface is accessible. 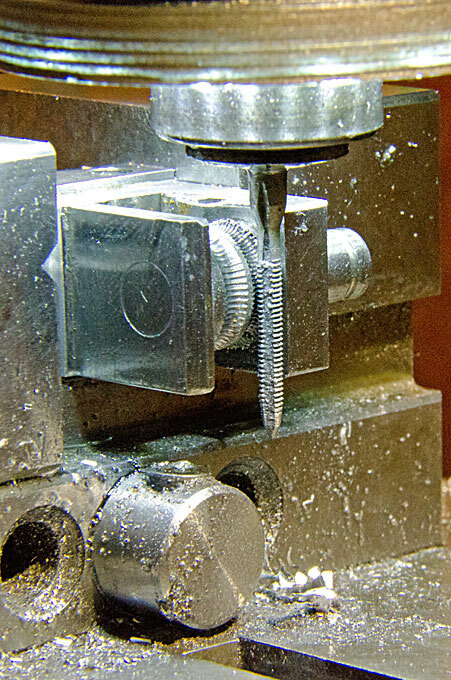 A drawback is that the vice is not hardened, as I do not have a capability for case-hardening. 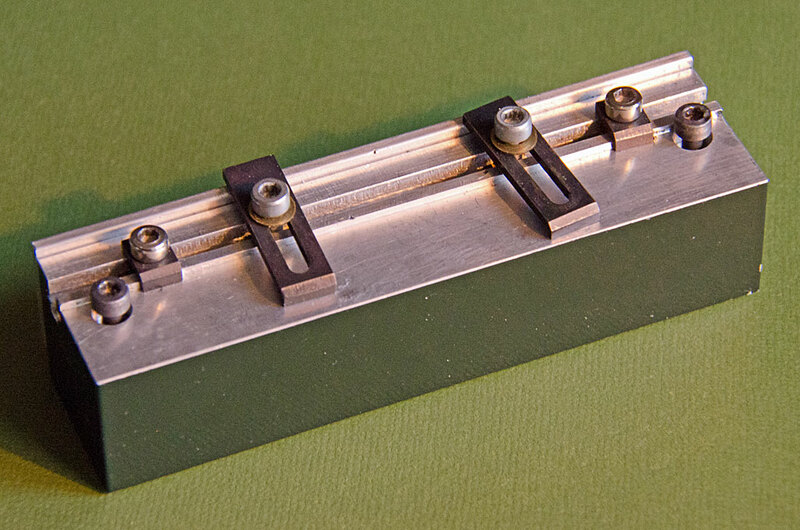 However, it is designed for working with brass, aluminium or acrylics. 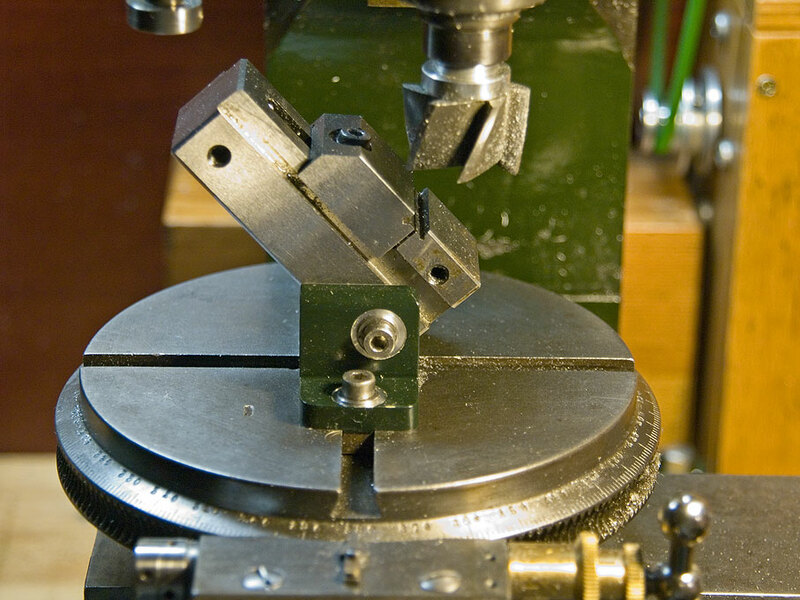 The moving jaw is guided and held down by dovetail that is machined to a close fit to the body of the vice. The vice can be used by its own, for instance as an insert-vice in a larger vice, or in conjunction with the swivelling holder. 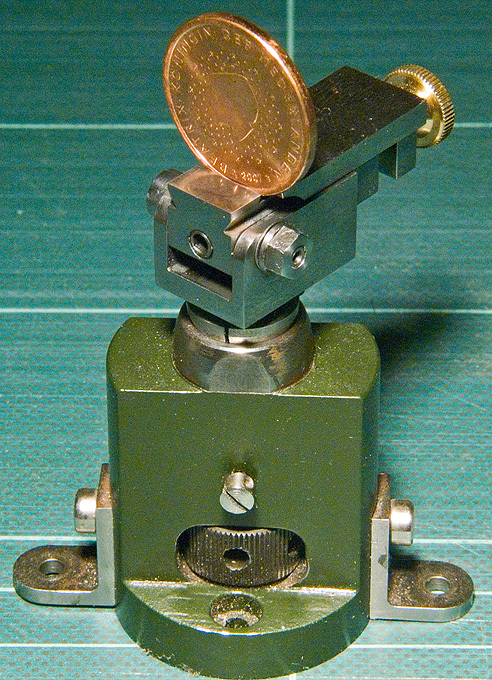 This holder allows to tilt the vice from 0° to 90°. 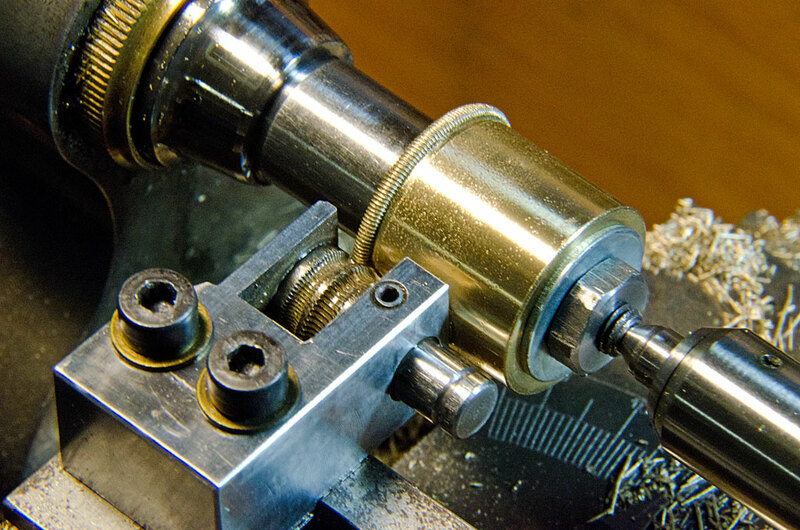 To ensure that it is perpendicular to the z-axis of the mill it rests on an adjustment screw. The holder has a 5 mm arbor for use in a no. 50 collet of the lathe. 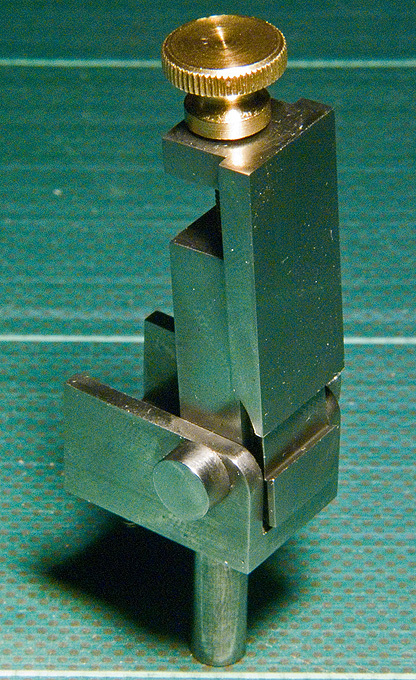 It thus can be used in the upright collet holder or in the dividing attachment. 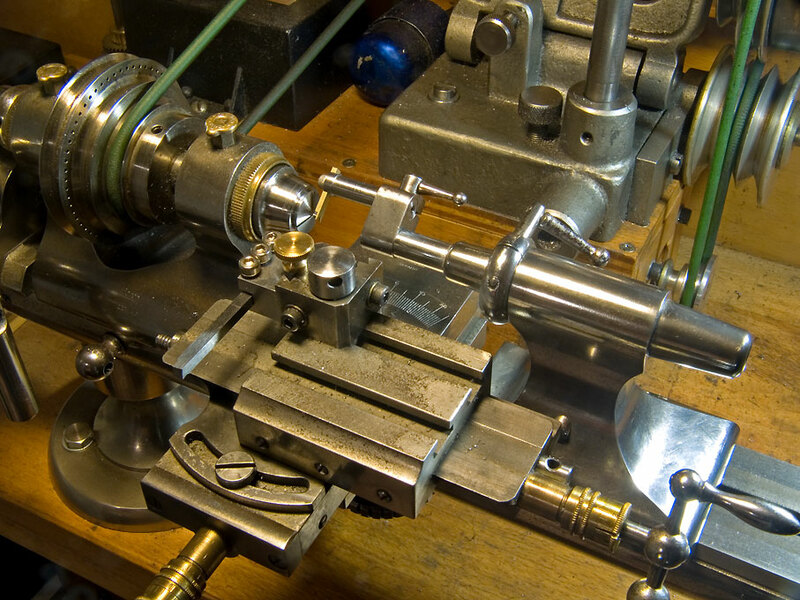 At not too high speed it could also be used in the lathe. 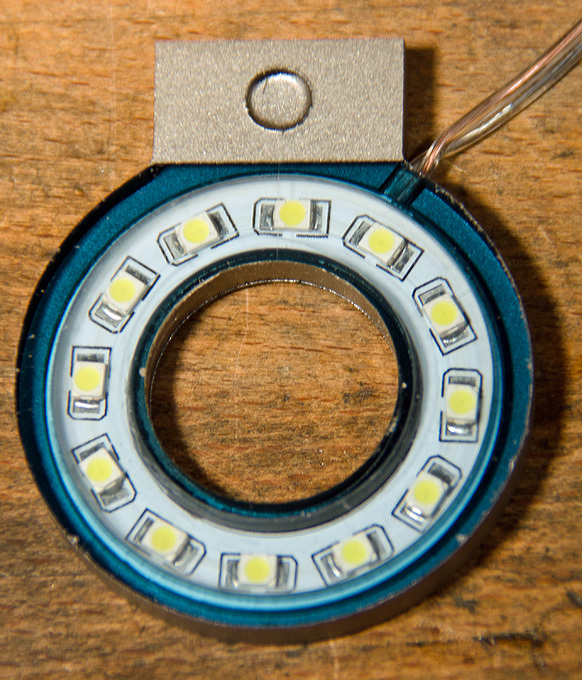 Ever since I came across the LED ring-lights for cameras and microscopes, I thought something like this would also make a good illumination for the milling machine. However, all these lights were to big and too expensive for the purpose. With my limited electrotechnical and electronics knowledge I did not dare to put something together myself. Then I became aware of the so-called 'angle eye' cosmetic tuning parts for cars. Apparently, these are fitted around the bulbs in car headlights to give the headlight a fancy appearance. They are produced in China and sold via ebay at a price at which I cannot get the components, not considering the hazzle of soldering everything together. 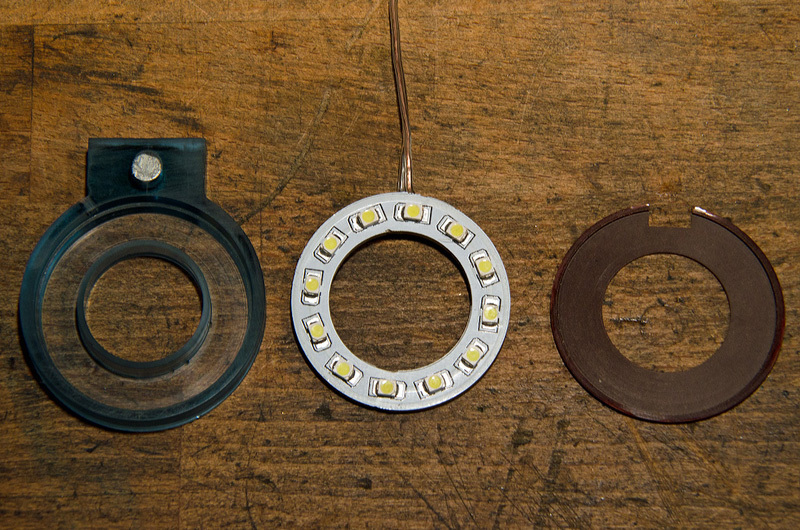 I ordered a couple (for obvious reasons they are always sold in pairs) and fabricated a lamp around these rings made from epoxy base-material. As I wanted to protect the LED from oil splashes I chose a Plexiglas-offcut of suitable size and bored an annular groove into it. The groove has a shoulder on which the epoxy ring rests so that the LEDs do not touch the front cover of the lamp. The outside of the lamp was milled to shape by holding the body in a three-jaw chuck mounted on the upright collet-holder. The backside is covered by a washer-like lid turned from a piece of bakelite sheet. Into the 'handle' of the lamp a neodynium magnet was embedded that holds the lamp to the spindle of the milling machine. The lamp was painted using a stainless steel acrylic paint. As LEDs require a current-stabilised power-source, I ordered, again from China, a small electronic transformer or 'driver' for LEDs. Today, concave knurls to produce such patterns are obtainable only at prohibitive costs. 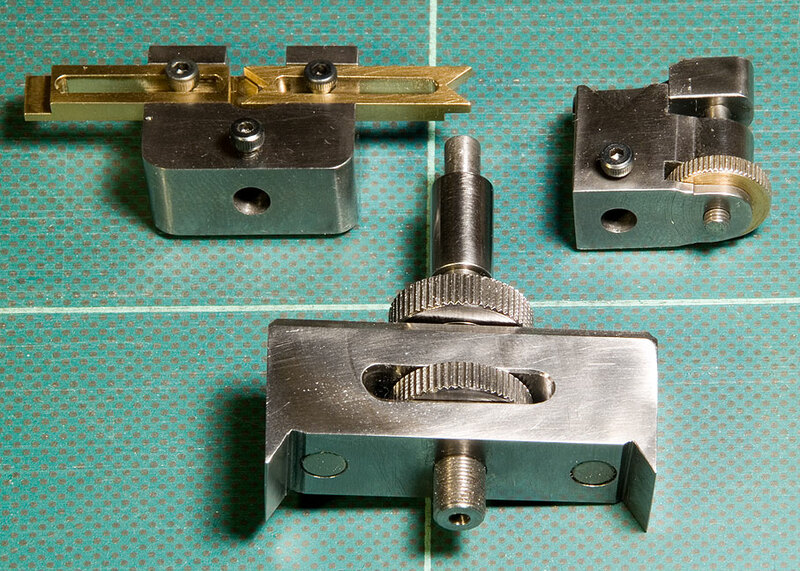 Therefore, I embarked on making my own knurl, encouraged by a few examples on the Internet. 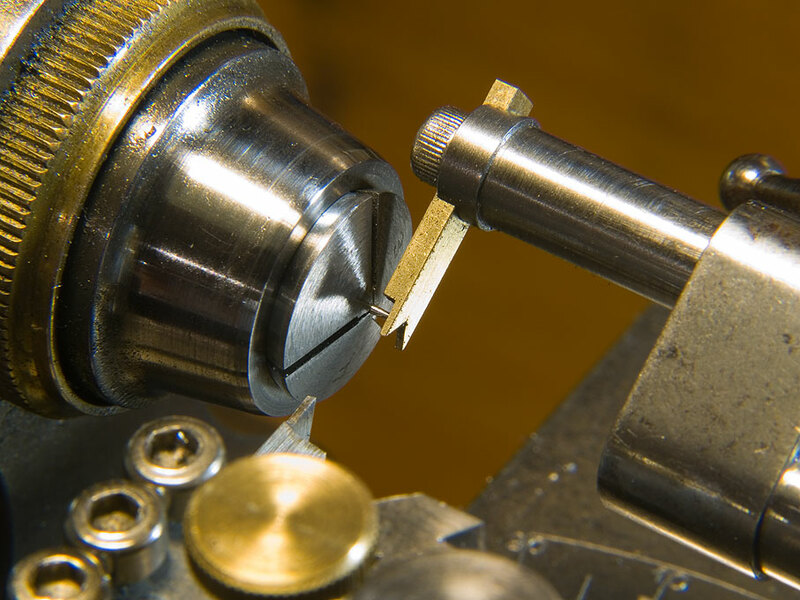 Knurling wheels normally have to have a certain diameter in order to prevent their bore from being distorted under the stress of the knurling process. I choose a blank of only 10 mm diameter for a bore of 6 mm in order to reduce the mass to be heated, when attempting to harden the knurl with my rather limited heating capabilities. 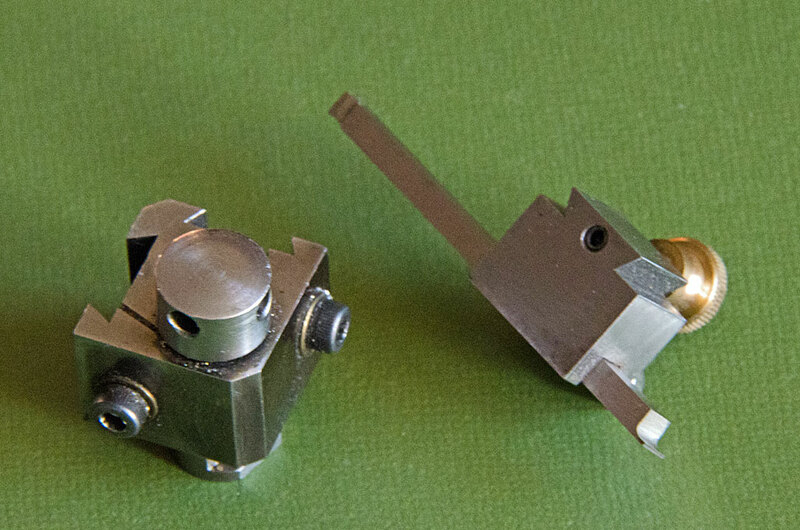 I also had a cut-off from a Schaublin collet-blank available, which I assumed would harden nicely. The proposed process of creating the knurling wheel employs an ordinary threading tap as an improvised hob. This, stricly speaking, would result in a 'rope' knurl, but the helical angle of a, say, 0.4 mm pitch tap is barely perceptible. 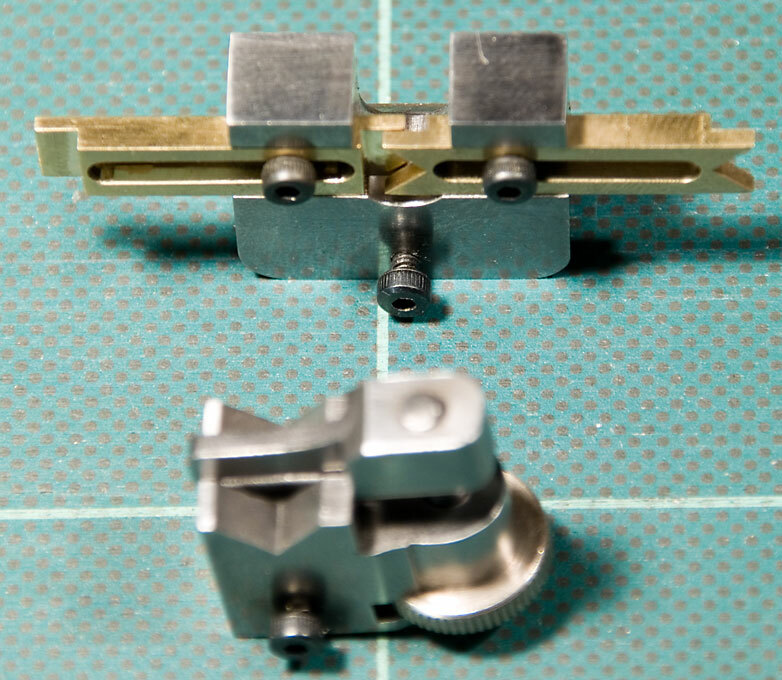 The easiest way to hold the blank for cutting seemed to hold it in the knurling-holder for the watchmakers lathe that I made a few years ago. This means, however, that the process could not be done on the lathe, because it would have been not so easy to mount the holder on its side. Cutting the knurl on the lathe would have been better, as the end of the tap could have been supported in the tailstock to eliminate flexing. Unfortunaly, the DIXI horizontal mill does not have an overarm, which then would make it the ideal machine for the job. So the job was done on the vertical mill. 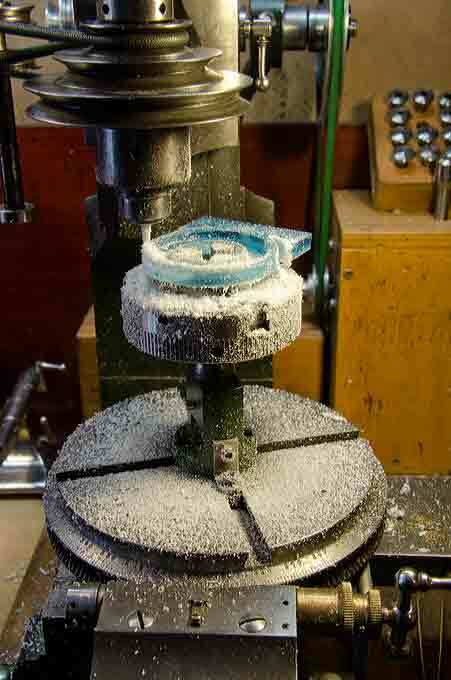 The blank was drilled and reamed for the arbor of knurling tool holder. Some polishing ensured that it spun freely. 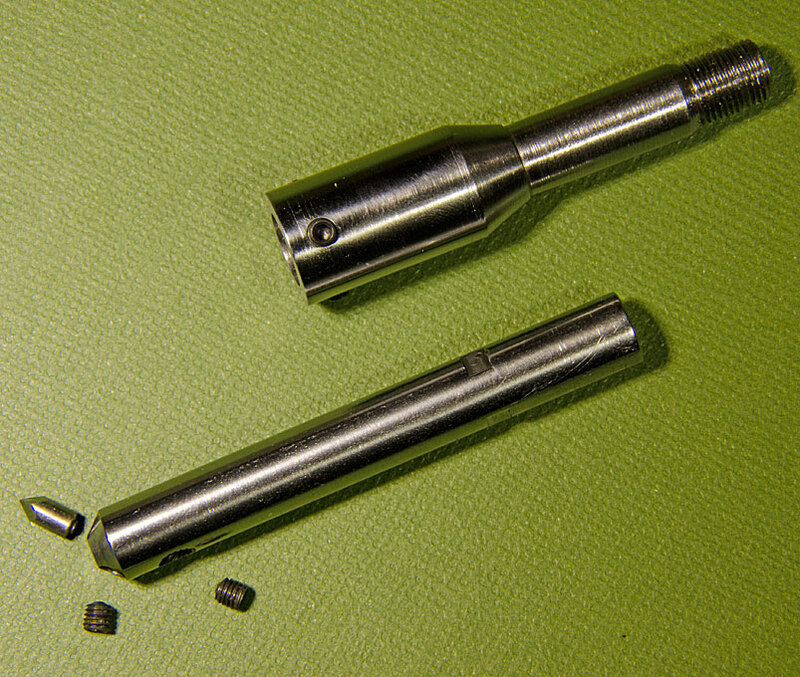 A M2 tap was chucked in a collet as short as possible and offered to the blank with its uppermost end in order to keep flexing to a minimum. Initially, the mill was run at slow speed and with a small feed. After each incremental feed, the blank was allowed to make several revolutions until no chips were produced anymore. 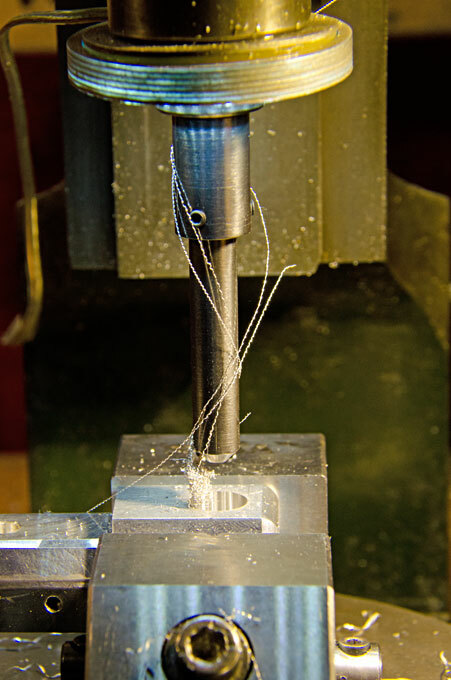 Once the pattern was created, the mill was run at a somewhat higher speed and the amount of incremental feed increased from around 0.03 mm to 0.05 mm. Every time blank and tap were flooded with WD40 in order to wash out the chips that then were wiped off. A first failed trial showed, how important it is to wash-out chips. The second attempt was successful. 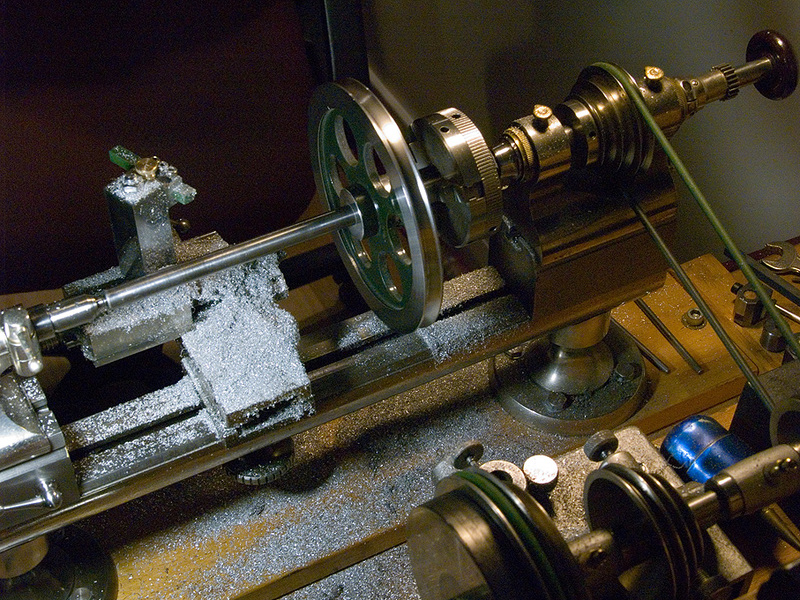 After the machining, the knurl was hardened by heating it to a cherry-red colour and quenching it in ice-cold water. As I don't have a very strong torch, the knurl was pre-heated to 450°C using the hot-air soldering gun and then brought to temperature with the gas-torch. The knurl was also rubbed in soap to prevent scaling. 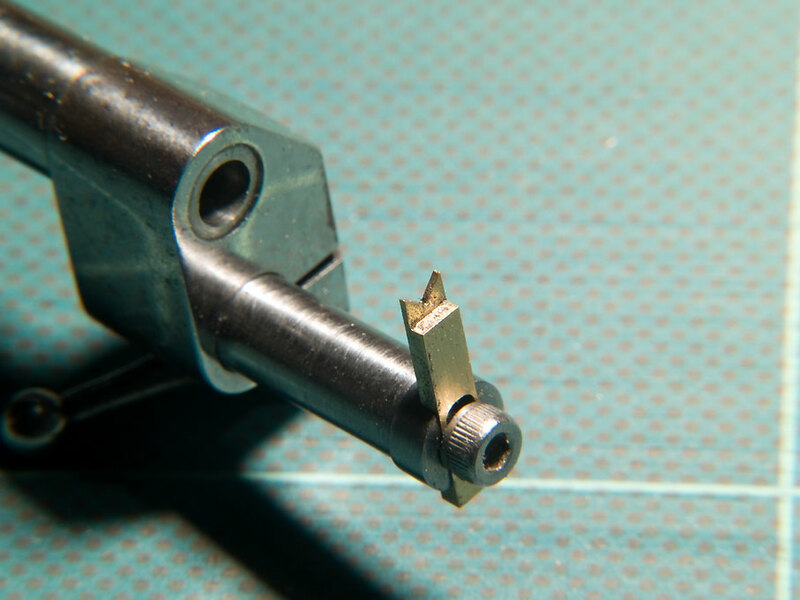 After some cleaning, the hardened knurl was tempered to a straw-yellow colour using the the hot-air gun. A test with a file showed that the hardening was successful. 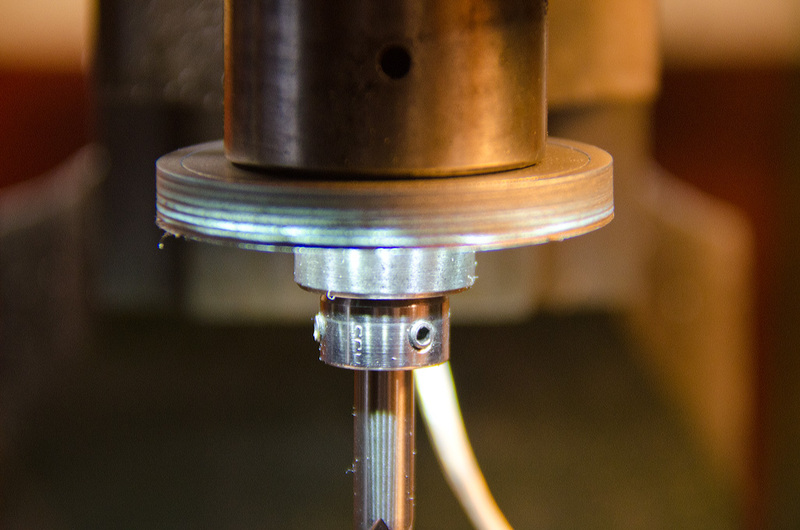 Holding small flat parts for milling is often a problem and one needs to have a variety of devices and vises to account for the various needs. Some time ago I made the device pictured below. 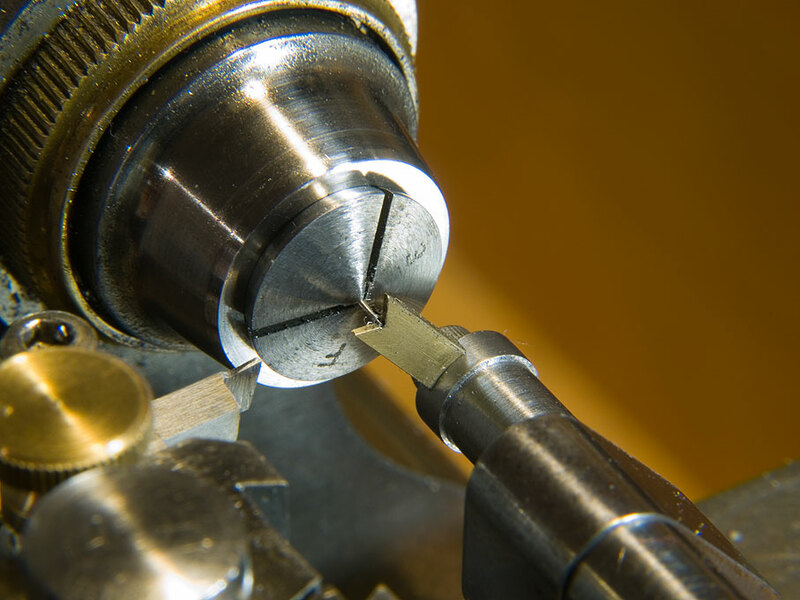 Essentially it is a small sub-table that raises the part to within reach of the milling cutter. Two finger are provided for downholding and two stops prevent the part from slipping backwards and forwards. A strip of metal at the back that can be raised or lowered provide a fulcrum for the downholding fingers. This sub-table is clamped with two screws and T-nuts onto the mill table.